We have already established that my Mom rules. The following story only solidifies this fact. We had just crossed a bridge, and there was no place to pull over, but one look at my nephew even whiter than he normally is on a daily basis and I knew this was one of those no-good kind of situations. What did this woman in her thirties do? I moved my purse out of the way. I prayed that he wouldn't barf on my coat. I yelled at my brother to pull over. What did my mother do? She pulled off the beanie she had on her head, held it under my nephew's mouth, and let him spew the M&M's he'd been snacking on during his plane ride right into it. 'Always a Mom,' she said, rubbing his little back. She didn't need to say that. We were all thinking it. The poor little guy had a couple more rounds in him, and by the time we were almost home he was covered in yuck and exhausted from it all. 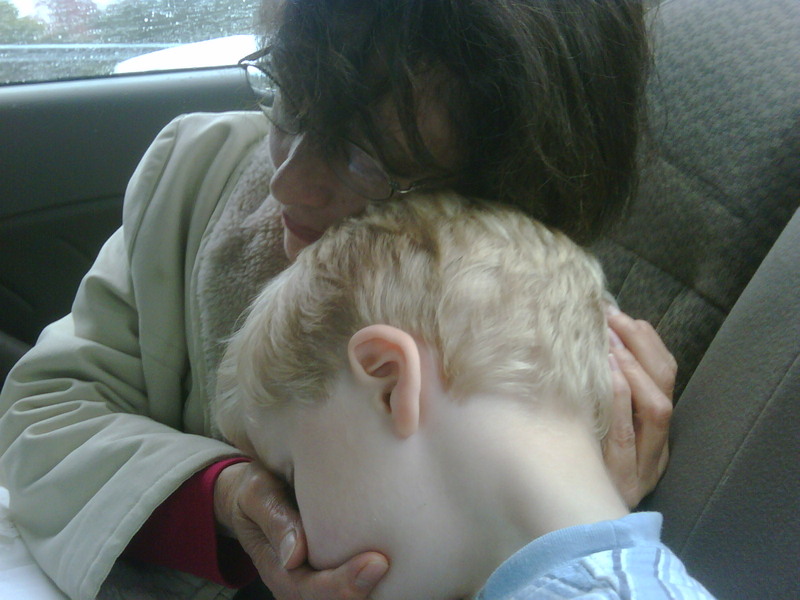 My Mom held out her hands so he could rest his head in them, and before we knew it he was asleep. Oh - this is so incredibly sweet. Adding "waterproof beanie" to your Christmas list. And your mom's. I love love love this story... and the picture, well, is priceless. You will totally be that mom!